Spend a Saturday afternoon sipping around the stroll-ready village. The wine-fun day returns with eats, winemaker cameos, and more on Saturday, Aug. 25. 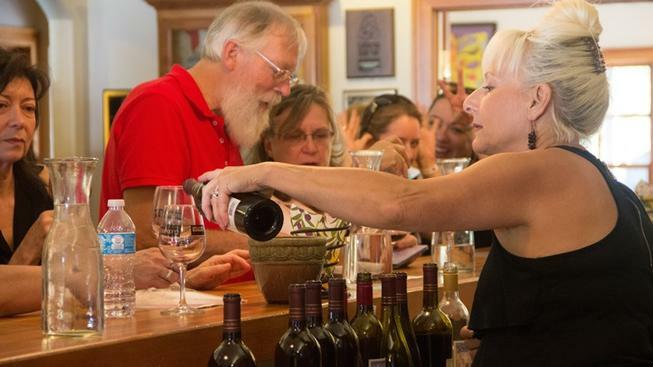 SATURDAY, AUG. 25, the hours are 1 to 4 o'clock, and a host of wineries shall show, including Bangor Ranch Winery of Butte County, Fawnridge Winery of Placer County, and Montoliva Vineyard and Winery of Nevada County (as well as several other Nevada County favorites). Bringing up the bites end of the three-hour stretch? Look for "17 restaurants, caterers, and specialty shops" serving up everything from charcuterie-type meats to chocolates (oh, yes, and cheeses, too, of course). Shall there be a wine-oriented raffle? You bet. Will there be a day-before to-do, all about meeting winemakers, at Nevada City Winery? That happens on Aug. 24. A TICKET TO THIS GOURMET GATHERING... is $35 ahead of time and $45 on the day. Need your Nevada City, in all of its funk-a-tude, deliciousness, and wine-flavorful goodness? Be there at the end of August, one of the sweetest and most mellow times in a sweet and mellow town.